Alison Chambers of Emerald Media has been over to Hungary. 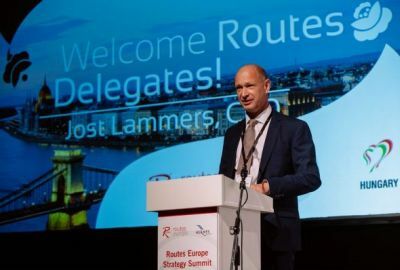 Over 4,000 face to face meetings, 1,100 aviation delegates, 115 airlines, 350 airports, 50 international exhibitors – last week’s annual Routes Europe gathering looked and felt more like a mini World Routes. There was an eagerness to do business in the halls of the capacious SYMA sports centre which had been converted into a Excel look alike for the three-day networking event. The vodka bar, popular in Tallinn last year, had given way to a snazzy red cappuccino and expresso bar – centrepiece of host Budapest Airport’s stand and the place to head to in the meeting breaks. All eyes were on hosts BUD. It has had its problems (see below). Last year’s event in Tallinn had been very good. Together with Hungarian Tourism, Budapest gave us an indoor football match, a walking tour of historic Buda and Pest and a glitzy dinner in the historic old terminal one building, former home to the airport’s low-cost carriers – for the annual marketing awards. 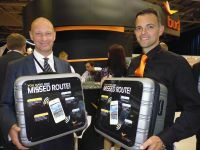 This year Munich took the main award, a reflection of its marketing efforts. Athens was the winner in the four to 20 million passenger category and in the under four million group Aberdeen, Routes Europe’s host in 2015. Turismo de Tenerife scooped the tourism marketing award. It had reason to celebrate with confirmation at the close of Routes that Vueling is to launch flights from Tenerife North to La Coruna twice weekly. Budapest Airport, which dramatically lost its national carrier Malev in February last year, reflected on that life changing time. “We spent €100m on a new terminal (SkyCourt) and a year later our national airline went bust. Airports must be flexible today. The romantic model of the past is broken", declared Aviation Director Kam Jandu. “It really taught us to change our way of thinking. 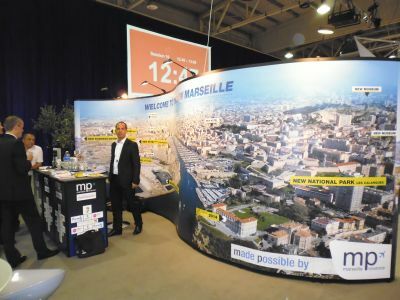 A new low-cost carrier came in and said we do not want a bridge, we do not want a bus – low-cost carriers are changing airport thinking in the way it does business". This proved to be a major theme in Routes’ Summit discussions. Wizz Air CEO, József Váradi, a former Malév executive himself, said: “We all had a duty to work with the airport and re-establish customer confidence. The paradigm of how airlines and airports used to be set up is changing. Budapest represents those changes and this shows there is life beyond national airlines”. He added that there are actually many airlines for sale in Europe because their owners/governments simply don’t know what to do with them. There are still some markets that are not fully recovered since Malev’s demise, said Budapest Airport CEO Jost Lammers. The goal now is to close the white spots on the map – more services from Spain, Germany, France – and New York, Toronto, Bangkok and China are on the wish list. Today, it offers 81 scheduled destinations, served by 35 airlines. In order to encourage more traffic the airport announced an incentive scheme for thin routes where airlines would qualify for a 50% reduction in charges for the first year. Subject to Hungarian CAA approval, BUD hopes to implement this in June. Wizz Air, Hungarian centralised, is heavily focused on launching its new Dubai World Central services this autumn and is fostering ambitions to move further into East Europe. More services to Ukraine, Georgia, Bosnia and Herzegovina are on the agenda to further bolster the already strong route map. It is restricted in terms of range as it will not consider moving to bigger aircraft (as a dedicated Airbus A320 operator). There are only two genuine low-cost carriers left in Europe, said Varadi, and we are one of them. It is not doing connecting flights either. However, if passengers do want to take advantage of our low fares and fly London Luton – Budapest and then on a separate ticket to Dubai that is welcome, he said. While 15% of its business today does not have any competition he is mindful that the market evolves all the time. This was the problem with SkyEurope, he opined. They didn’t see Ryanair coming. Adapting to challenging economic conditions is exactly what SkyWork Airlines CEO, Tomislav Lang, has been doing since he became a 40% owner in the company. Things like company cars have gone and there have been new working packages for pilots and cabin crew. Even senior management took pay cuts. It isn’t about the money, he said, it is the passion. “Our goal is to break even by the next Routes Europe”. He also hinted that a new route base to complement its Bern hub was on the cards – “and they speak German”. Sunday’s Strategy Summit was the platform for 12 high-profile speakers from Europe. Routes chairperson Nigel Hayes asked them for their predictions over the next 12 months. Among the answers were that Berlin Brandenberg would still not be open and that Turkish Airlines would have an ownership change in the next year. (Alison’s prediction is that Richard Maslen, Editor of Routes Online, will have one, if not two people helping him next year. With his tweeting, videoing, blogging and interviewing, he was averaging three hours’ sleep). 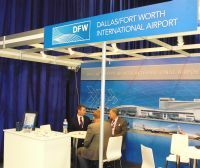 Christian Schneider, CEO of Darwin Airline said that 44 new regional carriers started in the past five years, but 22 disappeared inside a year. There was also discussion on the rise of the Middle East carriers with references to alliances – Star, OneWorld and Skyteam blurring with Emirates, Etihad and Qatar Airways. Fernando Estrada, Strategy & Alliance Director at Vueling commented that 20% of its traffic in Barcelona is now connecting traffic and it’s still growing, but it will reach a limit. “But we won’t change our model. We are profitable on a point-to-point basis, and the moment you change that you have lost your edge”. If Vueling is edging more to a hybrid model, so too is Germanwings – which has taken over all of Lufthansa’s short haul services outside the main hubs of Frankfurt and Munich. How to keep Germanwings low-cost DNA while harvesting the advantages of the Lufthansa Group, that is our challenge, noted Dirk Kokott, Director of Business Development. Vijay Poonoosamy, VP International & Public Affairs, Etihad Airways led the debate on Europe’s contentious emission trading scheme. “If the EU hadn’t stopped the clock, the emission trading scheme (ETS) would have cost the aviation industry €3.5bn in 2012 and more every year after that”, he said, hitting out at the various national taxes on aviation in countries such as the UK and Germany. European Low Fares Airline Association Secretary General, John Hanlon, said that the reduced scope means that only 12.5% of European aviation emissions fall under EU ETS now.